Others might have complained or murmured, or sought to assign blame for the failure to bring enough. But Christ took what they had, expressed gratitude to God, and then acted with what He had and worked a miracle. Should that not be our approach each day? Let us take whatever we've been allotted, even if sparse and seemingly inadequate, and instead of complaining or focusing on what is missing, take it with gratitude and seek the Lord's help to turn it into something more. Gratitude is more than just a way of being kind and Christlike. It's a key that can unlock miracles as we act in faith. I mentioned these points in a talk I gave in Church today. I also mentioned an LDS man who once told me that he had never received an answer to prayer. I think that gratitude may also be one of the keys to more fully experiencing the blessings of prayer, and recognizing the many answers and helps the Lord does give us. When we look for the hand of the Lord in our life and recognize and thank Him for the blessings He has given, I believe that He will help us see even more and experience even larger reasons to be grateful. I believe that we will more fully see that there is a loving and living God who answers prayers and helps us today as He did in centuries gone by. May we approach God with gratitude and have our eyes and hearts opened to see what God has done and will do to bless us. Here's the talk from President Monson. A real classic, in my opinion. Sometimes the Lord is so generous in helping us deal with our own foolishness. Sometimes He kindly arranges for second chances, for opportunities to recover from disaster and walk away with only minor damage done, hopefully wiser for the experience. Other times we are not so lucky. When it comes to my mistakes, I seem to have unusually bad luck much of the time--when I do something foolish, if something can go wrong, it often does. I think my string of bad luck might be a teaching tool to remind me to always be cautious, and to remember that small stupid means can bring about great big stupid messes. I guess it makes sense in light of the Book of Mormon, where we are told about how the Lord can achieve great things through small and simple means. (Alma 37:6-7) If great good things can be achieved through small righteous means, what about all the small stupid things we do? Naturally, they can lead to great big stupid messes. One rumor spread can damage all sorts of friendships. A small unkind act can keep someone from coming back to church. A moment of distraction while driving can result in the deaths of good people. It's a dangerous world out there, and we need to be cautious every moment, every day. We need the Lord's help constantly, every hour, to maximize the good we do and minimize the harm. I've had my share of small stupid means creating massive unintended messes. So frustrating. So perplexing how minor sloppiness or semi-innocent foolishness can escalate and lead to all sorts of trouble. But I had a second chance experience earlier this year. Can't say much except to express gratitude. So amazingly grateful that I was able find a solution after much tormented prayer, one that involved being able to reach someone at exactly the right time to apologize and fix a potential disaster before someone else got hurt. An unintentionally stupid action came close to being a disaster. Whew. Someone else was able to be generous and kind in my moment of need and make everything OK. But I learned a few painful lessons in the process. May we be careful each day, working out our salvation with fear and trembling (those are Paul's words in Philip. 2:12, not modern Mormon heresy) because it is a jungle out there, and our small slips can become much more troublesome that we ever imagined. Stick to the straight and narrow and pray for help each day to avoid errors that injure others, and pray even harder for help to recover when those slips occur. Sometimes, maybe just sometimes, the Lord can help us avoid some of the great and stupid consequences of our own bad behavior. "Free Wheeling Mormons" are those who have wheels and freely share them to help others. No, it's not just Mormons who are free wheeling in this sense--many good free wheelers of all faiths are out there putting their wheels to work. I'll look at some LDS aspects of this issue, though. Consider, for example, two friends of mine, one a Mormon Bishop and faculty member at a major university, and another a generous Mormon in Zion 2.0 (a.k.a. Wisconsin). Both have trucks and don't hide that fact from the world. That means they are always getting calls to help people move furniture, mattresses, and all manner of junk. The bishop told me he puts his truck to use two or three times a week in helping out ward members. That's quite an example. The natural man in me says that if I had a truck and were called to be bishop, I'd trade it in for a motorcycle in a hurry. When my wife and I purchased our minivan, we felt particularly led to consider it a consecrated vehicle. In the almost seven years we've owned it, we have used it to contribute greatly to LDS Emergency services as the church sent help after the seven hurricanes that hit the US in two years. We loaned it to a family whose only vehicle has blown an engine so the father could get to work, which allowed him to save enough to fix the truck eventually and return our van. We loaned it again to a friend whose van lost its engine during flooding in our area when his wife was literally pulled off the road by a powerful surge in a storm that came so suddenly the whole town was caught unawares. Finally we let another family borrow it while their much older van received repairs that allowed them to continue to use it. I am leaving my name off of this post because I am not concerned about credit: I want to say how blessed our family has been every single time we have so willingly responded to these needs without worrying about government assistance or church welfare. Each of the families we were able to help had already blessed our lives and continue to do so by their love and friendship, but even beyond their direct help, we have seen so many ways we have been supported in our own struggles. Wow, that is really going the extra mile, or allowing others to go the extra mile on your dime. I'm touched by that example. Those free wheelers also learned that the art of generous sharing brings blessings far beyond what is sacrificed. I've been away for longer than normal - sorry about that. Wild adventures, amazing ones, really, that I'll share in the near future. Meanwhile, here's a brief thought as I struggle to get me back into the rhythm of blogging. I think that it is a duty incumbent upon all of us to "apologize" in the original sense for our faith. It’s simply a human duty to apologize in that sense for positions that you hold. We all have an obligation. It's an individual obligation, and it’s incumbent upon all of us. The disdain some faithful LDS members show for apologetics may come from their misunderstanding of what apologists are trying to achieve. We don't expect our arguments to take the place of the Spirit in converting people. But without defense, there can be much greater damage from the offense of the adversary. Exactly. I've seen that so many times. The inability of many Latter-day Saints to help others when challenged with common arguments and attacks has led to many souls falling away unnecessarily. Many wandered and struggled in despair not knowing that there were good answers and explanations to help them deal with challenges that shook them. We would do well to be a little better prepared to help those struggling in the faith. 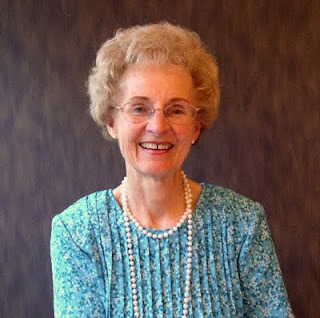 Last Monday I was in Utah for the funeral of one of the most remarkable women I know, my mother-in-law, Doreen Larson. I've never been able to understand mother-in-law jokes, but I bet she could appreciate son-in-law jokes. One of the things that I like about her and her now-deceased husband was the loving concern about the person her daughter, Kendra, was hanging out with. Was that strange tall kid trustworthy and good enough for her daughter? Doreen's values were so different from the rest of the world. Case in point: As a bright student at the University of Washington in her junior or senior year, she was one of two finalists for an outstanding scholarship. Coming from a family without much money, the scholarship would have meant a lot. She wasn't getting any money from her family for college but was completely on her own, working to put herself through college. Now she had a shot at a significant scholarship that would have made life easier. In fact, in her interview as a finalist, the committee essentially told her that she was going to be their pick. How exciting! As she left the interview, she met a man waiting out in the hall and started chatting (she's such a friendly and loving person). She learned that he was the other candidate scheduled for an interview with the committee right after her slot. She learned that he was married and had kids, and learned that he really could use the money. You know what she did? I just love this about her, and didn't know the story until the funeral. My wife didn't even know until the night before when Doreen's brother shared this story that Doreen kept pretty much to herself. She decided that this other man, a stranger with a family, needed the money more than she did. She made her decision on the spot, excused herself from the conversation with the other candidate, and went back to the committee she had just met with to decline the scholarship. She declined it--to help a stranger, a man who probably never learned how magnanimous and selfless this woman was. We didn't know the story until after her death, but we knew her character and know that this is exactly the kind of thing she could and would do for others. After raising 7 wonderful children, she and her husband chose to go on a mission to serve others in Nepal. This was not an easy place to live. The poverty and challenges of the people could be overwhelming. When surrounded by numerous people begging for money from Americans, it's easy to grow callous and just ignore everybody. But she prepared some money and food every day to be able to help, seeking to follow the Spirit to do the most good with her giving. She had some powerful spiritual experiences in finding people she could help, in addition to the primary service work they were doing in an institution. Always looking for ways to help others, even under trying circumstances--that was Doreen Larson. 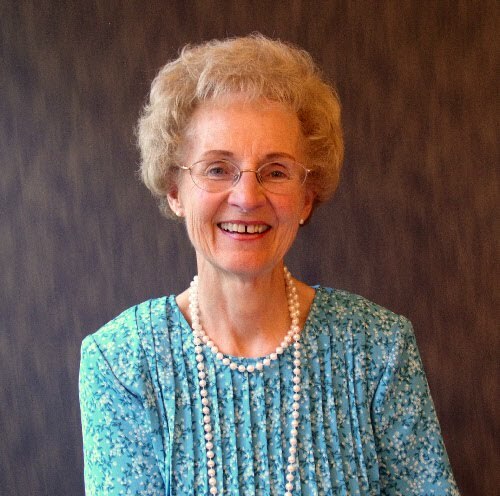 Quietly, privately, without fanfare or press releases, she was serving people throughout her life and lifting others in so many ways. She was one of the healthiest and most active people I know. How surprising that she would be diagnosed with cancer and then pass away just a few days later. Mercifully, she had time to say goodbye. As an example of her vigor, when my wife and I and a son went to Barcelona, Spain a couple years ago, we were delighted that she was able to go with us. (Again, I don't get mother-in-law jokes. It was always a pleasure and honor to have her around.) Though well into her 70s, she had no trouble keeping pace with us as we trekked through the city, or maybe we were trying to keep pace with her. Vigorous, high energy, and a just a lot of fun. Her love and charity weren't always apparent, though. Yes, I'm referring to her penchant for crushing--with a smile--all who stood in her way when playing card games. Canasta, Uno, Rack-O, cribbage, you name it--she was tough and merciless, usually winning with glee. I guess you can call it tough love. She was one of the toughest when holding cards. How I regret that I won't be able to avenge myself and attempt a rare victory until after the Resurrection. Unfortunately, by then she will have honed her skills to perfection, but I still look forward to the fun of sitting at a table with her. Such a delightful and powerful woman, an incredible mother, and a humble but bold servant of Jesus Christ who changed many parts of the world for good. How grateful I am that my children have such people as part of their heritage. Happy Mother's Day, Doreen, from all of us! Like my own parents, Doreen and her husband served as missionaries and met on their missions. When she met Elder Larson, an elder sharing her last name of Larson, she kept a watch on him because she was worried that the Larson name would be jeopardized by any bad behavior. She initially thought he was a tad arrogant but would learn he was just shy. She worked in the mission home in the Central States Mission in Missouri (to her chagrin--she wanted to be out proselyting, but her advanced office and organizational skills were probably indispensable) and Floyd would soon be the Assistant to the President, frequenting the mission home also. She came to realize what a remarkable man he was. Years later her husband would scandalize her in jest by claiming that they used to hold hands under the table at the mission home. "Floyd!!" I don't think they did, but I have no problem with good missionaries recognizing something very good in others on their mission, while staying dedicated to their work and abiding by the rules as I am sure they did. But what a sweet romance that relationship would become, one that was not erased by death. How strange it is today to not be able to pick up the phone and wish her a happy Mother's Day. I hope she gets this message somehow. How we miss her, but how proud we are of who she is! Given the heavy emphasis on education in Latter-day Saint life, it's encouraging to see one of the most thoughtful books on innovation and reform in higher education not only comes from two highly respected LDS authors, but also draws upon successful innovations in education made possible by visionary LDS leaders. The intertwined stories of Harvard and BYU-Idaho create a fascinating tale showing us what can and must happen in higher education in the future. What follows is my review. The landscape of higher education is about to witness dramatic change and many institutions may be poorly prepared. The forces of change that will sweep over higher education are foretold in The Innovative University: Changing the DNA of Higher Education from the Inside Out (John Wiley & Sons, 2011), a landmark book by Clayton Christensen of the Harvard School of Business and Henry J. Eyring, Vice President of Academics at Brigham Young University-Idaho. Clayton is the man who gave the world a new lens to better recognize the threats and opportunities of "disruptive innovation," and Henry Eyring at BYU-Idaho is a thought leader who has chronicled the details of a successful experiment in disruptive innovation in education at BYU-Idaho. The collaboration of Christensen and Eyring represents a pleasantly surprising combination of talent and insights, one that is fitting given the influence of Harvard on BYU-Idaho’s journey of innovation. Henry J. Eyring kindly allowed me to interview him about this forthcoming book that is scheduled for release later this summer. He displayed great passion for the mission of taking the blessings of education to more people at lower cost, and applying new tools and business models that can make this possible without sacrificing quality. Henry is concerned that the cost of a 4-year college degree has increased by 2 to 3 times since the 80s while starting salaries for graduate have remained flat in real terms, leaving universities vulnerable to classic disruptive innovation in which a once easy-to-ignore "inferior," low-cost alternative improves gradually to the point where it can become a serious threat. Online course content, once viewed as inadequate, is now generally accepted by students and can result in better educational performance, especially when used in hybrid models with face-to-face elements and with adaptive tools that respond to what and how students learn. Online models can allow a course to be customized to meet the learning styles and needs of a student, improving the quality of education. "Existing universities must view online learning as a sustaining innovation for their models," Eyring says. Failure to embrace the potential of online learning will leave universities vulnerable to disruption, both from competitors and from budgetary pressures. "Even the best universities will be pressed to show better ROI." They may need to become less universal, no longer offering the same graduate programs in all fields as they do in science and engineering. There is a need to change the very DNA of the university, the thrust of The Innovative University, a remarkable fruit of the collaboration between Henry Eyring, who began writing about the BYU-Idaho experience in 2008, and Clayton Christensen, who teamed up with Henry to add the framework of disruptive innovation and further insights from the Harvard perspective to complete this scholarly but highly readable work. The importance of online content as an element of disruptive innovation is emphasized in the book, which offers numerous valuable insights into the business models and applications of the technology that have brought success to BYU-Idaho, as well as the foundations for Harvard’s success and leadership in education. The authors don't call for the abandonment of traditional universities, but building on their strengths and helping their limited physical and other resources be able to serve more students at lower cost. Those interested in either Harvard or BYU-Idaho or in higher education in general should appreciate the historical development and insights. Many other innovative schools are also highlighted in case studies throughout the book. The authors use the theme of DNA throughout the book, and argue that successful educational reform requires changing the DNA of a university. "Genetic reengineering" is needed to build new models and systems that will be sustained over time and grow. The book is aimed at identifying and spreading the new genes that will result in healthier, stronger education. For those that resist and cling to the old DNA, disruptive innovation could one day overtake the universities and leave them unable to compete and unable to serve, saddled with shrinking resources, higher costs, and fewer students willing to endure their increasingly less competitive programs. Though higher education has remained relatively immune from the pressures of disruptive innovation for years, the power of new business models and technologies coupled with social and financial pressures will lead to dramatic change that may surprise and even pummel many universities now on the traditional path of making education more expensive and elite. 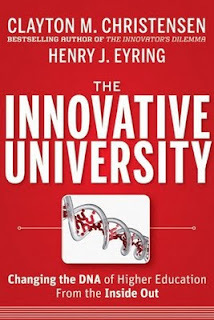 Christen and Eyring offer a monumental guide to avoiding the pain of disruption and capitalizing on the promise of positive disruptive innovation for those institutions with the courage and vision to become an innovative university. For educators, policy makers, parents and students, I recommend The Innovative University for breakthrough thinking that can help transform education. Further information below about BYU-Idaho is derived largely from some online comments by Steve Davis, their Alumni Director. Any errors are mine. Since the decision in 2000 by President Gordon B. Hinckley to turn Ricks College into BYU-Idaho, the university has grown from a capped enrollment of 8,200 students on a traditional fall/winter track, to over 14,000 students each term and over 22,000 annually -- largely because of the innovative 3-track (year round) enrollment. BYU-Idaho has also launched several online initiatives, including the Pathway pilot program, discussed several times in The Innovative University, that enables students to earn BYU-Idaho professional certificates, associate, or bachelor degrees while staying at home. The online offerings at BYU-Idaho are different than independent study in that each course is semester and cohort based. Students are part of cohorts, groups of students they will interact with to enhance the educational process. or example, students in an online section could have classmates from other Pathway sites, as well as regularly enrolled BYU-Idaho students. I once gave a presentation on leadership to a group of educators where I stressed the need to help engineering students have more practical experiences that will help them be more effective leaders in their careers. I emphasized the basic principle required for proactive leadership: identifying where you want to be and then actively taking steps to get there from where you are now. So simple, but many organizations and individuals fail to do this with serious intent. In discussing leadership experiences for young people, I was mostly thinking of experiences like collaborative technical projects. But there's another collaborative project that might also be an important but often neglected part of their education: dating, as in formally asking someone out and going on a real date, even one that is planned. Not long after my presentation, I had the pleasure of meeting and chatting with a General Authority of the Church. In our conversation, he mentioned that when President Monson was asked what problems in the Church most keep him up at night,the answer was surprising: "Girls without dates." The General Authority went on to tell me that the Church is very concerned about young men who seem to be passive about life and do not make progress toward marriage, leaving many women even at places like BYU feeling frustrated and neglected. Many young men seem to think that "hanging out" with their friends is sufficient and do not take the steps required for courtship. That's when it occurred to me that the failure of many young men to date reflects the problem of leadership skills. The passive approach to life, the one that is content with television and video games, is one that allows people to stay in thir current state without actively seeking progress. The proactive approach is focused on goals and deliberate steps toward desired ends. If one is an active Latter-day Saint, chances are that individual recognizes marriage as a desired end. But that is a goal that requires activity now, even the painful growth activity of asking someone out and planning a date. What better way to develop proactive leadership skills, and perhaps solve some major social problems as well? Young men, there are too many girls without dates. Become a proactive leader now and change that. There's no future in video games. There's not a lot of future in whatever you're doing just hanging out with buds. But there is a future in dating, courtship, and marriage. My opinion, of course. We need leaders in this world. Now get out there and start generating some proactive leadership experiences. While visiting an LDS ward in Hurricane, Utah, I recently heard a talk given by a young woman from Denmark who came to Utah on a high-school student exchange program, if I recall correctly. Her father (or step-father?) was a non-attending Mormon, but she had essentially no exposure to the Church before coming to Utah and was not LDS. She was invited to attend and was interested but apprehensive as a newcomer to the ward. Her concerns melted almost instantly when she was introduced to the bishop's daughter. "I'm so glad you're here!" the LDS young woman said as she welcome the Danish visitor. She took the newcomer by the hand and brought her to the right class and helped her make new friends. This simple step was a huge one and helped the girl have confidence enough to keep coming and learning. The Danish girl, when she spoke, was scheduled to be baptized in Denmark. She shared her testimony and her conversion story, which was far more than simply having a good social experience. It involved a spiritual quest, studying the scriptures and gaining her own testimony through prayer. But the warmth of a sweet LDS woman made all the difference in getting that process started. A good reminder about the need to love one another with warmth and kindness, especially the strangers in our midst. It's easy to stay in our own little spheres, but so much good comes when we step outside and take simple steps to greet and welcome others. One more case of great things coming from small and simple means.